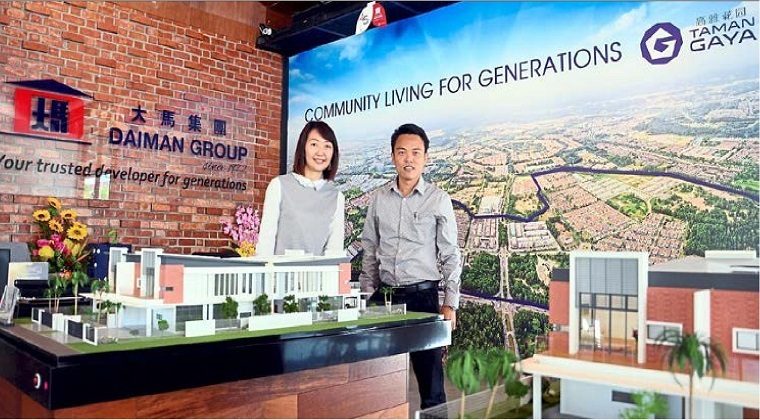 Daiman Development Bhd sales and marketing manager Irene yeoh (left) with property development general manager Heng Song Teck at the company's new sales gallery in Taman Gaya. DAIMAN Development Bhd will continue to focus on what it is known in Johor’s property market for the past 45 years as one of the reputable developers of landed properties. Property development general manager Heng Song Teck says the company has no immediate plans to venture into high-rise residential property. “Demand for our landed properties in Johor is still good despite the ups and downs in the property cycle since our establishment in 1972,” he says in an interview. Heng believes, given a choice, Malaysian consumers prefer landed properties to high-rise apartments or condominiums. He says the company does not see the need to jump onto the high-rise residential property bandwagon although many developers in Iskandar Malaysia are doing so. Heng says its on-going Taman Gaya in Tebrau Corridor, Iskandar Malaysia and Taman Daiman Jaya @ Kota Tinggi will keep the company busy for many years ahead. “Daiman is a reliable name in the southern region with 45 years history and our Taman Johor Jaya, Taman Sri Tebrau and Taman Sentosa projects are a testament to quality homes and satisfied customers,” he says. Heng said 95% of its customers are locals and foreigners only made up 5% of the buyers’ portfolio adding most of them are owners- occupiers. He said its customers remain loyal for years and most of them are repeat buyers including the children or grandchildren of the first generation of property owners in Taman Johor Jaya, Taman Sri Tebrau and Taman Sentosa. On that note, Heng said the remaining 25% of land in Taman Gaya for niche development with high-end landed properties targeting upgraders and extended families. “We are not only selling houses but also neighbourhood as we found our buyers are more comfortable staying in an area with owner-occupier rather than renters,” he says. Daiman had last year launched 72 units of semi-detached and cluster homes with built up area from 3,200 and 3,600 sq ft (297.2 and 334.4sq m) and with price tags between RM1.4mil and RM1.7mil and expected to be completed by the end of this year. As for Taman Daiman Jaya, the company is targeting at first-time house buyers and small families looking for affordable double-storey terrace houses. The company had on March this year launched 69 units of double-storey terrace houses at Taman Daiman Jaya with 1,689sq ft (157sq m) built up area and priced from RM440,000. “There is a growing trend where first-time house owners working in Johor Baru are looking at houses in Kota Tinggi and Ulu Tiram areas and a similar house in Johor Baru can start from RM650,000 and above,”says Heng. Meanwhile, sales and marketing manager Irene Yeoh says Daiman’s new sales gallery in Taman Gaya is more than just a place showcasing the company’s products. She says residents in Taman Gaya are always welcome to use the place to organize activities and programmes which will benefit them. Among the activities and programmes residents could conduct suggests Yeoh include talks on recycle, reuse, gardening such as making compost and DIY house repairs. “We hope to start a communal garden project soon where residents can get together to plant vegetables, fruit trees or herbs andshare the harvest among them,” she says.